Lexapro, the brand name of the medication escitalopram, is a type of selective serotonin reuptake inhibitor, an antidepressant commonly prescribed to treat depression. Although this medication can be effective, it can produce unwelcome and even dangerous reactions when combined with alcohol. Anyone considering drinking alcohol while taking Lexapro should talk to a doctor before doing so. Many people experience side effects while taking Lexapro. Some common side effects include mild nausea, gas, heartburn, upset stomach, constipation, weight changes, dry mouth, yawning, ringing in ears, drowsiness, dizziness, sleep problems and sexual dysfunction, lists Drugs.com. Alcohol affects the body in many ways. It can cause slurred speech, euphoria, confusion, impaired coordination, impaired short-term memory, prolonged reaction time, reduced attention span, slower thought processes, stupor, coma, respiratory paralysis and even death, according to Drugs.com. The intensity of the body's reaction to alcohol is dependent in part on how much and how quickly the alcohol is consumed. 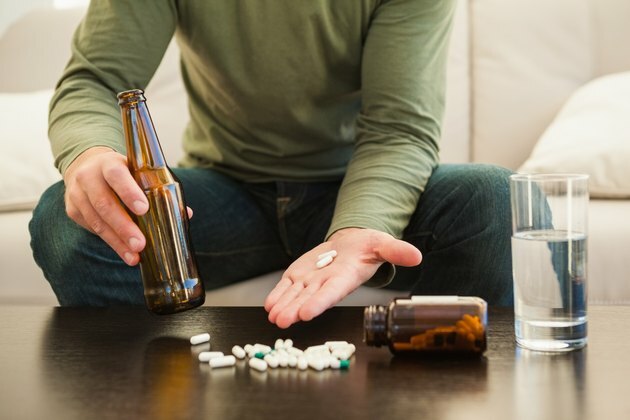 Drinking alcohol can essentially undo the way in which Lexapro stifles depression, so people taking both alcohol and Lexapro will often feel an onslaught of depression. This can be particularly dangerous in teenagers because it may trigger suicidal thoughts or actions, according to the National Institute of Alcohol Abuse and Alcoholism. In addition, the unpleasant side effects of Lexapro will be exacerbated by alcohol. Feelings of drowsiness or dizziness may be particularly severe, as these are side effects of both Lexapro and alcohol.